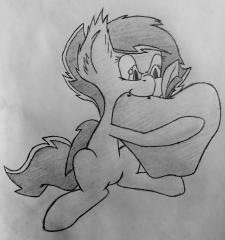 Here's an extremely quick reference sketch I made for my new OC Errant Flame. I didn't want to have to bother with lineart (but I still wanted to show how the colors looked on her), so I did a sloppy paint job. 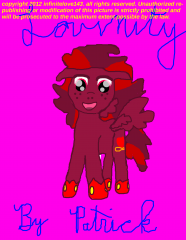 And made up a very unoriginal cutie mark. I drew this during my Pottery 1 class in High School. 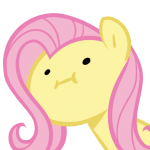 It was based off of an armored Fluttershy picture that I'd found online. I never had to color it, since it was only for reference material while I built it out of red clay. I'd say it's one of my finer drawings. Disclaimer: I am in no way a profession artist nor have I been drawing ever since I was born. I'm merely a student and much of what I'll be saying is me simply lending my own collective experience from school, books and from drawing. It's very possible that what I'm talking about could be wrong or lacking information so don't be afraid to point something out that doesn't seem to make sense or needs further information. No matter what is posted here or said, use your critical thinking skills and take what advice is useful to you. There's absolutely no wrong way to draw so experiment and find what speaks to you! This thread was inspired by Jenna who created a thread much like this on another forum whom disappeared after their laptop got fried. This thread is in dedication to her. 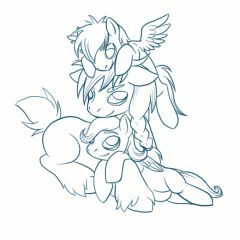 ~~~~~~~~~~~~~~~~~~~~~~~~~~~~~~~~~~~~~~~~~~~~~ Hello dear reader and welcome to the dedicated thread to learning how to draw ponies! Many times I've read comments and posts where individuals wished that they could learn how to draw, view artists as 'gods' or that drawing is impossible. This thread is here to change that. 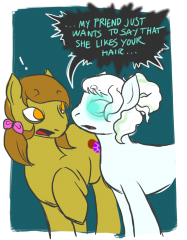 My goal, along with the help and input of fellow users, is that we all help one another learn how to draw our beloved pastel equines from FiM. How will we achieve this? 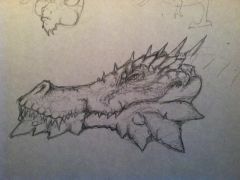 It's quite simple, we'll sketch an image that will be posted on a weekly basis. From there we can give advice to one another via feedback, critique or just by making simple suggestions. 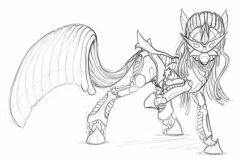 As time goes on the images will become more and more complex and while the main focus will be on drawing Equines we will draw other denizens of Equestria. This is a place for all levels of skill to learn and practice from one another in a welcoming environment. You do not have to draw every image so don't be afraid to jump right in if you're a newcomer to this thread! Here's an example of what we'll be doing: Told you it'd be simple! If you really want to get the most out of this thread than I'd highly suggest experimenting with your drawings. Don't be afraid to try out new poses, mediums or exp ressions. A large part of learning how to draw is simply experimentation, try out whatever your heart desires! 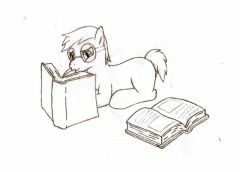 If you're having trouble learning how to approach your drawing you can check out EqD's Tutorial Codex as well as Reddit's MLP drawing School (Note: Contains NSFW content, tread lightly!) Don't be afraid to voice your questions, comments or suggestions, I'm more than willing to listen! Pick up those pencils, and lets get to learning! Whom We're Currently Drawing: The next image will be posted September 30th. Previous Images F.A.Q. Note: I'll update this as needed, promise! Update Log: (9/15/13) Added a new section - "I've got the basic materials but I don't know where to start!" including a video on "Visual Measuring." 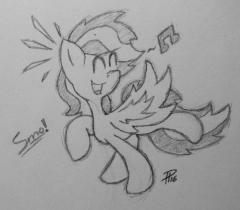 So unlike with humans i kinda just jumped into drawing ponies with little to no practice. while at first they looked awesome as time went on they started to look worst and worst. 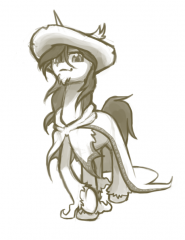 so i need your help canterlot. 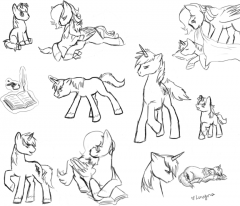 suggest ponies, ether Oc or cannon to sketch up! Please note that these are not full blown pictures. 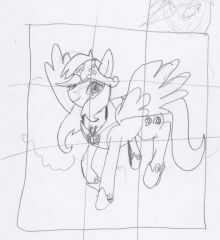 and will most likely look like... well, basic sketches. 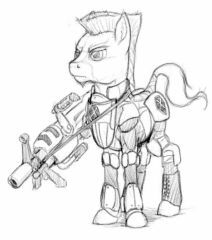 Past work Oc's " Devil's Blood" old Bass Rider picture Sillies Zombie Ponies commander Shepherd (mass effect) Oc power switch "ONWORD! 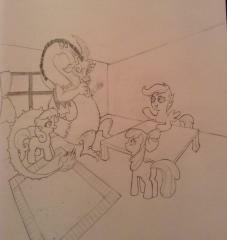 "Smile at the Heavies" "Full Blown Muffins" For more work be sure to check out my DA, Tumblr! and Bass Rider's tumblr! NOW START REQUESTING FOOLS!!! Looked back at my drawthread to see if I posted the finished version of this here. Turns out I haven't! 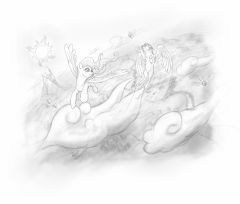 Picture made for the owner of the alicat character - the winged cat on the right. 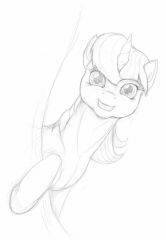 This unicorn subject is happy to see you. I find that I haven't been drawing as often as I perhaps should lately. 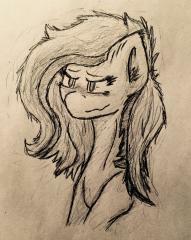 After a random sketch turned into this, I think now I know why. Darn aliens. 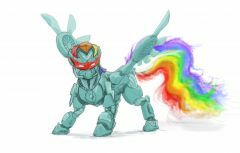 Apart from my usual randomness, I also have this MLP/Power Rangers crossover that I draw from time to time, though I've had feedback that my mecha designs don't match the characters too well. Can you tell which of the main six this machine belongs to, in absense of coloring? 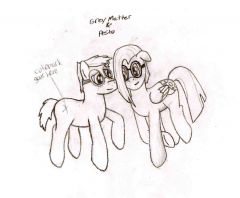 A sketch of Grey, and his fiance Pesto.